General purpose brown jersey work gloves with knit wrist and PVC dotted palm. 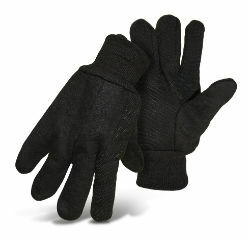 Comfortable Poly/Cotton Blend The knit wrist keeps dirt and debris out while providing a secure fit. Helps keep hands warm by preventing air from getting inside or escaping. Fits under clothing sleeves. PVC Dotted palm, thumb, and index finger for better grip.